Preprints (earlier versions) of this paper are available at http://preprints.jmir.org/preprint/12128, first published Sep 07, 2018. 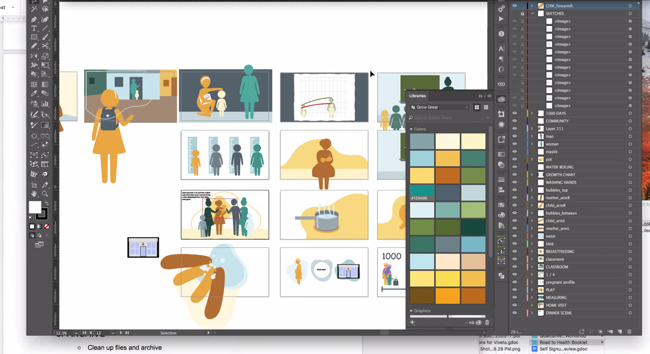 Drawing on 5 years of experience designing, producing, and disseminating video health education programs globally, we outline the process of creating accessible, engaging, and relevant video health education content using a community-based, human-centered design approach. We show that this approach can yield a new generation of interventions, which are better aligned with the needs and contexts of target communities. The participation of target communities and local stakeholders in the content production and design process fosters ownership of the content and increases the likelihood that the resulting intervention will resonate within its intended primary audience and be disseminated broadly. Ease of future adaptation for additional global audiences and modification of the content for multiple dissemination pathways are important early considerations to ensure scalability and long-term impact of the intervention. Recent advances in mobile technology can facilitate the dissemination of accessible, engaging health education at scale, thereby enhancing the potential impact of video-based educational tools. Accessible and engaging health education is a cornerstone of health behavior change. Especially in low- and middle-income countries, increasing access to effective health education can contribute to improved health outcomes. Prior research has identified several characteristics of effective health education interventions. These include the integration of pictures, narratives, and entertainment-education, in which the health messages that make up the educational content are embedded. However, the effectiveness and long-term impact of health messages ultimately depend on how well the end users can identify with the content that is presented. This identification, in turn, is a function of how well the messages correspond to user needs and wants and how this correspondence is communicated through the design characteristics of the health education intervention. Health behavior change, which can be motivated by effective health education, has been called “our greatest hope for reducing the burden of preventable disease and death around the world” . Improving maternal and child health through maternal education is especially important, given that more than 5 million children globally still die before reaching their 5th birthday, mostly from preventable illness . 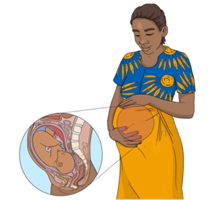 Health education efforts aimed at promoting behaviors like breastfeeding and kangaroo mother care lie at the heart of many successful efforts to reduce child mortality but increasing accessibility and dissemination of such health education remains challenging [3-5]. Narrative approaches to health education have emerged over the past decade as potentially powerful tools for promoting positive health behavior change [6,7]. As one of the longest-standing modes of human communication and knowledge transfer, Schank and Berman  suggest that stories function as cornerstones for learning, providing both the context for understanding and internalizing new information as well as a framework for remembering what we learn. Various theoretical models have been used to characterize the mechanisms by which narrative communication may lead to health behavior change, including the extended Elaboration Likelihood Model (ELM) . In this model, the effectiveness of peripheral processing of the health messaging depends on the viewer’s identification with the characters and their engagement (ie, absorption and transportation) with the storyline . One particularly successful application of the narrative approach to health education can be seen in entertainment-education (E-E) . E-E involves the delivery of health messages by embedding them in entertainment media. A substantial body of research suggests that E-E is an effective way of influencing beliefs, attitudes, and behaviors [9-13]. This approach may be even more effective in populations with lower motivation and ability to cognitively evaluate the health messages being delivered . E-E media is particularly impactful when the following characteristics are incorporated: (1) an appealing storyline, (2) high-quality production, (3) unobtrusive persuasive messages, and (4) high potential for involvement with the characters. Even the use of simple pictures, without an accompanying narrative storyline, has long been recognized as an effective way of enhancing attention to, and recall of, health education . A significant body of prior research suggests that appropriate implementation of pictures can positively influence patient responses to health instructions and improve their health behaviors [14-16]. Emerging technology including mobile and online education platforms [3,5,17] present new opportunities for the dissemination of video-based health education. In recent years, researchers have begun to document the growing potential for online learning platforms, mobile phones, and tablets to fulfill important functions in the dissemination of open-access health education [17-20]. The increasing availability of mobile technology in low- and middle-income countries (LMIC) foretells promising new avenues for the delivery and scaling of mobile health education to communities who need it urgently [3,5,17,21,22]. 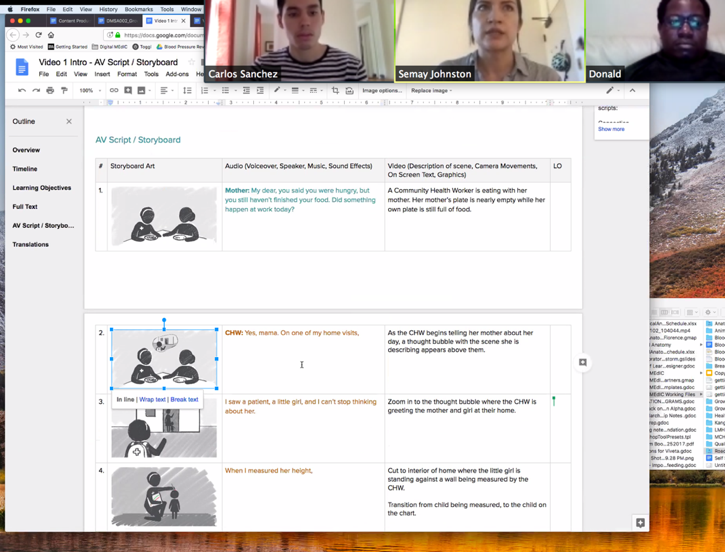 Since 2013, a team of health educators at the Stanford University School of Medicine and the Stanford Center for Health Education has been grappling with a challenge: how do we create optimally effective and engaging video-based health education tools and deliver them at scale by adapting them across a broad spectrum of global learners? Over a 5-year period, our target audiences have ranged from medical students and practicing physicians to community health workers in LMIC and the general public. Dissemination pathways for our content include university learning management systems, open online learning platforms, mobile apps, government clinics, and nongovernmental health organizations. The goal of creating content that is accessible, engaging, and relevant to the needs, wants, and experiences of the end user has been central to our learning trajectory. This has ultimately led us to apply a human-centered design (HCD) approach to the creation of our content and programs. HCD of health education revolves around several principles described in the literature, including empathy with the target communities, a process of rapid prototyping, feedback gathering and responsive iteration [23,24], as well as a tolerance for ambiguity and failure throughout the design process [25-27]. HCD involves integrating local characters, visuals, and narratives into accessible content, designed to deliver health messages that are collaboratively defined and created. A key principle of HCD is the idea that successful solutions should be created with the needs and wants of the end user in mind. Aligning with this principle, our content creation process has developed over time to rely increasingly on multiple cycles of feedback from community members in our target audience (our end users) and rapid iteration in response to that feedback. Especially in under-resourced and low-literacy settings, we have found that taking a community-based approach, by involving the target audience in the content creation process, is more likely to yield health education programs that are truly rooted in the contexts of the communities they intend to serve. Furthermore, through the creation of video-based teaching tools featuring narratives and visual elements that resonate with end users, we believe we can optimally engage our target audiences, empowering them to improve their own health behaviors and ultimately, their own health outcomes. The positive global response to our work contributed to the founding of the Stanford Center for Health Education in 2017 and its nonprofit global health education arm, the Digital Medical Education International Collaborative . Overall, 8 video-based health and medical education initiatives, developed by our team over a 5-year period, generated the guidelines presented in this paper. These formative projects are described in Table 1 and presented along a development timeline map . Multimedia Appendices 1-11 are referenced within this table and contain relevant video samples. Table 1. Health and medical education initiatives (2013-2018). An additional challenge when creating health education content for dissemination at scale is the need to easily adapt that content across different learner populations, different platforms, and across time. 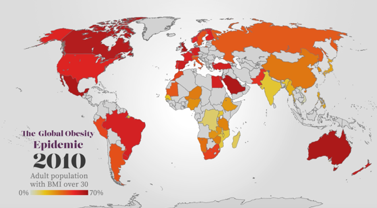 Adaptability across different learner populations, including language groups as well as cultural and socioeconomic contexts, is essential for broad scaling of health education content, both within countries and internationally. In community health education, this can mean designing characters that would resonate across ethnic and socioeconomic groups within a given country. In medical education, this can mean including both units of measurement or presenting a symptom generically as “an elevated body temperature” rather than “a fever of 102 degrees Fahrenheit,” which limits the scalability of the content internationally. Easy adaptation facilitates the reach and therefore the impact of each video asset created. This also greatly contributes to the cost-effectiveness of such video-based health education. The need to easily adapt content for existing and emerging platforms and delivery pathways also requires careful consideration. Especially given the current global trend toward increasing penetration of smartphones and other mobile technology , video-based health education should ideally be optimized for mobile dissemination in the future, even if it is delivered in the shorter term using older platforms, such as university learning management systems, DVDs, offline tablets, or in-clinic television screens. As data costs decrease and the number of smartphones increase around the world, effective content needs to remain flexible and easily adaptable for emerging mobile dissemination pathways. This can include zooming in on diagrams or detailed images, such that the main teaching points can easily be appreciated even on smaller screens. Decisions about the nature of the visual media included in health education videos will also have enormous implications for file size, with the inclusion of video footage and high-resolution artwork resulting in much larger file sizes than more simple visual styles. Given the relatively high cost of data in some LMIC, file size can have significant implications in terms of adaptability for mobile push messaging. 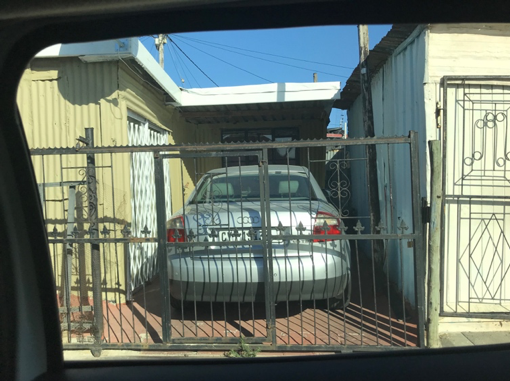 In South Africa (SA), a country with 11 national languages and a population that is ethnically, culturally, and socioeconomically diverse, a community-based, HCD approach has been instrumental in addressing the challenges of engagement and adaptability. The 2 projects described here illustrate the application of such an approach. 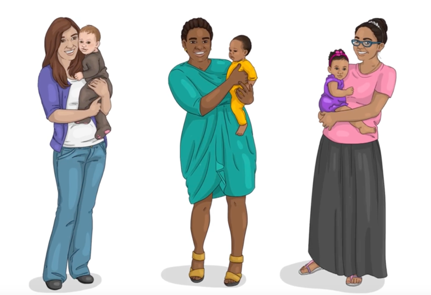 The 100% Breastfed Initiative, launched in March 2018, consisted of a series of 10 breastfeeding educational videos targeted primarily toward SA mothers. During the formative, early discussions with local health workers and community members, it was suggested that the educational series should include on-camera interviews with celebrity mothers who would serve as role models and representatives of SA’s ethnic diversity. Feedback from 2014 and 2016 massive open online courses (Table 1) suggested that the inclusion of the celebrity perspective seemed to enhance engagement within the general public. Overall, 3 SA celebrity mothers were identified, interviewed, and included in early draft videos. 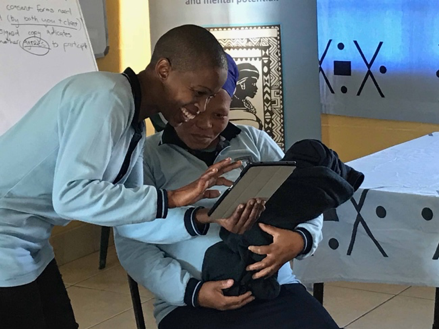 Community members and local clinics viewed the content and suggested adding the perspectives of community mothers to emphasize that many of the challenges faced by new mothers in SA transcend these demographics. This suggestion was accepted and implemented in the next iteration of the video series. Freehand, digital illustrations, drawn by a local SA artist, and branding (including a logo, see Table 1) were later also integrated in response to input from a large SA women’s media publishing house. The illustrations were intended to underscore the cross-cultural nature of the health messages, by reflecting South Africa’s ethnic diversity. The logo and branding were intended to facilitate national dissemination of the campaign. 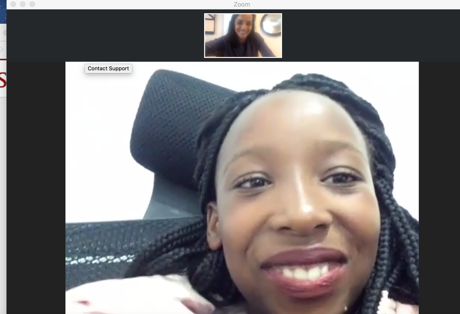 A total of 4 versions of the course were created in parallel for different audiences between July 2017 and March 2018 (English for SA mothers, isiXhosa for SA mothers, English for SA health workers, and an international version, launched on Coursera). 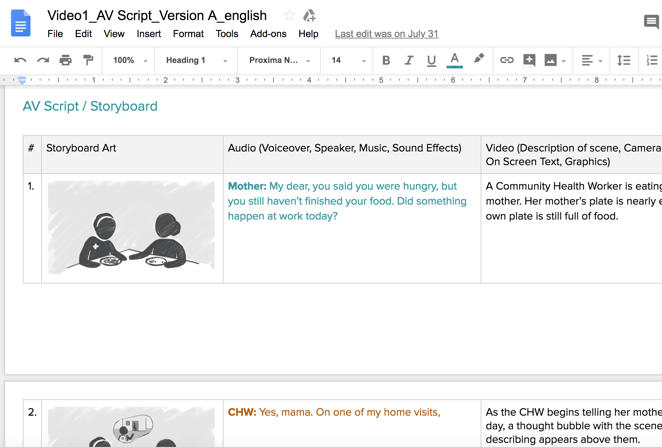 The scripts for each teaching video were created in real-time collaboration with 11 local stakeholders using Google Drive to manage version control. For each video, an audio-visual script  showing 3 parallel versions would be finalized before production would begin. 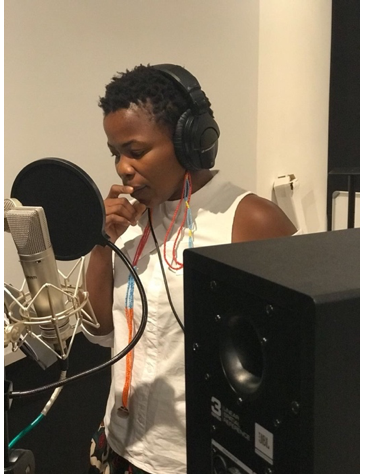 Version_2 (advanced) was later converted into 2 versions, one narrated by twin SA medical doctors, Vela and Phinda Njisane, for SA health workers and the fourth version narrated by a Canadian health educator, for a massive open online audience. As early drafts of the videos were completed, these were shared with local community advisors using WhatsApp, a communication app that supports the transfer of video files. This feedback led to several iterations of the images, characters, and content, a process that continued throughout the production period. WhatsApp was a significant production asset, useful in soliciting feedback from community members who did not regularly use email and did not feel comfortable editing scripts using Google Drive. Final content prototypes were loaded onto android tablets to be used by Community Health Workers in physical brainstorming sessions, described as “bodystorming” [23,51] in prior HCD literature. During these sessions, community health workers engaged in role-play that involved testing the intervention in mock-counseling sessions, observed by members of the production team. The final video series was launched in March 2018 and has since also been translated and dubbed in Afrikaans. Over the next 12 months, the content will be translated into several other national languages. A cluster randomized controlled trial involving 1008 pregnant women was launched in September 2018 to study the effects of the 100% Breastfed series on breastfeeding rates in the study participants. Although the videos have been well received to date (see Table 1), we realized that this approach had some limitations. First, the file size of videos containing live footage is considerably larger than those containing simple illustrations or animations. This makes dissemination via mobile push messaging to smartphones prohibitive at present, due to the relatively high cost of data in South Africa. 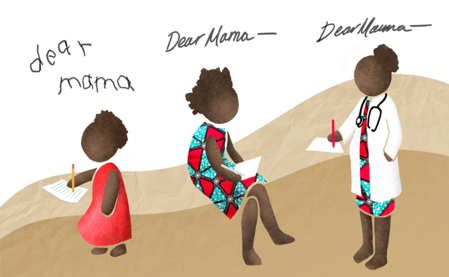 Second, adapting the content for use in other African countries would require identifying and interviewing local mothers in each country, then re-editing the series to give it a local flavor. Although the freehand, digital illustrations are somewhat easier to adapt, they would also require redrawing for each target country to accurately represent different styles of dress, local facial features, local foods, etc. 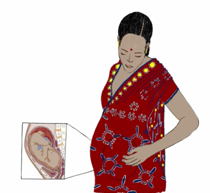 We encountered similar issues when adapting the 2015 Community Maternal and Child Health course (originally created for an under-resourced urban South African population) for audiences in India (2017) and Burkina Faso (2018). Although live footage and realistic depictions of characters can be powerful ways to enhance visual identification with characters, this approach also limits the ease of adaptation of the resulting content, an especially important consideration in countries or geographic regions that are home to multiple diverse ethnic and socioeconomic groups. The Road to Health Book (RTHB) is a child health initiative of the South African National Department of Health, first launched in 1973 and updated for relaunch in 2018. The goal of the initiative is to provide new mothers across South Africa with education and resources to help them become more engaged in their child’s health, in partnership with their child’s health care providers. In 2018, we were invited to begin creating video-based content to support the RTHB initiative. The main challenges were (1) to create content that would resonate across SA and (2) to dramatically reduce the file size of the video content because the data charges associated with using the content would be reverse billed to the National Department of Health. Formative discussions with local SA stakeholders in maternal-child health, as well as feedback from earlier online courses, helped to distill a central goal: to create a visual style that was extremely simple (yielding smaller video file sizes) and universal enough to resonate across ethnic and socioeconomic groups, ideally with the possibility of repurposing the content for a global audience in a cost- and time-effective way. While retaining visual simplicity, the content needed to elicit enough emotion in the viewer to engage a lay audience who was choosing to watch the content voluntarily (ie, this was not required viewing as part of a formal educational program). Feedback from a 2017 massive open online course (Table 1) suggested that the inclusion of dialogues between family members or individuals involved in close interpersonal relationships was a powerful way to engage learners, even in topic areas where initial motivation to attend to the content was low. 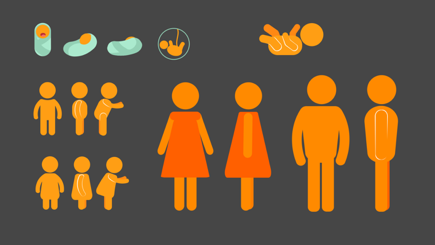 Over the following 4 months, we solicited feedback on different iterations of simple icon-style characters through a process of rapid iterative testing and evaluation described in the HCD literature [23,24]. Each resulting prototype served as the new design direction until consensus was reached on a modified version of the “universal human” icon that is used globally in public places, most commonly to indicate the location of restroom facilities. Table 2 summarizes the prototyping pathway. Visually, these icon-style characters were enhanced through the use of various nonskin tone colors and textures. Their settings were kept similarly universal by relying on simple shapes and lines to represent props in the environment, such as eating surfaces or places to sit. Table 2. Visual development progression. Localization of this new video content style relies almost entirely on the audio components, which feature the voices and narratives of the target audience as well as a soundtrack. 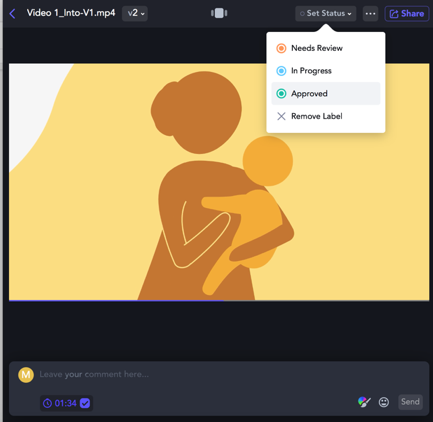 By recruiting the end users of the content to help shape and deliver the voiceovers, these videos acquired an authentic, community-based quality, according to early, informal feedback from SA community members. The next steps will include conducting formal focus groups across different language groups as part of the National Department of Health’s evaluation of the RTHB initiative. The main advantage, from a production perspective, of employing a simple visual style with reliance on the voiceover and narrative for localization, is that this approach is easily adaptable, by changing the audio components only. Furthermore, involving the end user (or target community) in the voiceover recordings and intervention development can serve to empower these communities and facilitate ownership of both the educational content and the health behaviors they aim to promote. This work rests upon the theoretical underpinnings of the ELM , which suggests that there are 2 contributing pathways to achieve the changes in attitude that predict a desired behavioral outcome. The first central route is influenced by the learners’ motivation and ability to cognitively process the information presented. This can be influenced by factors such as the length of the content and the degree to which the language used is accessible to the learner. The second peripheral route relies on cues embedded in the method of information delivery that contribute to its relative acceptability to the learner. Positive, peripheral cues, such as the learners’ subjective evaluation of the narrator or the learners’ emotional involvement in the content, lead to peripheral attitude changes, which, although less enduring than central attitude changes, can positively influence the learners’ motivation to process the messaging via the central route . 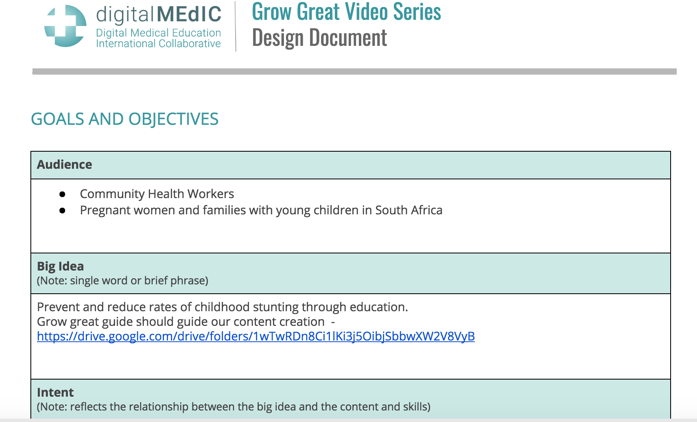 In this section, we outline the steps we have followed when creating video-based health education content, using HCD. These production guidelines help to standardize the video production process across projects and teams as well as supporting quality control and time management. The guidelines were developed collaboratively, over 12 months, by content creation leads and creative team members in the United States and South Africa. The guidelines are based on prior research on the effects of different video production strategies on learner engagement . To some extent, the desired style of content being produced will define the video production workflow , as well as the production team skill sets and the budget needed to support such work. 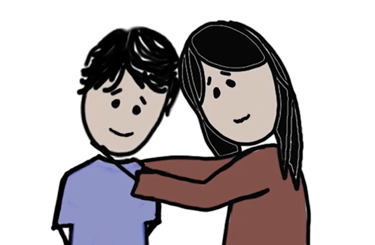 For example, creation of the storyboarding and animatic steps, described below, would primarily be text-based descriptions of anticipated footage for a video integrating mostly camera footage, whereas the storyboard and animatics would primarily consist of draft illustrations for an animated video. In Table 3, we describe our workflow as well as provide examples and strategies for optimizing each phase. Multimedia Appendices 11-14 are referenced within this table and contain relevant video samples. Target communities are empowered as the strengths and resources within them are identified, harnessed, and showcased. Recognizing the human resources already available within a community, by involving them in the production of their own health education content, serves to validate, educate, and enable that community. Empowered community members can promote health within their peer groups and can advocate for increased access to resources like health and social services on behalf of their communities. An empowered community recognizes and prioritizes health education and the behaviors associated with improved outcomes. They also become valuable partners in the dissemination of their own health education content. This approach fosters improved health awareness, increases identification of the target communities with the content, and creates a sense of ownership among community members who participated in the production of that content. General health awareness improves as a result of peer-to-peer education (word-of-mouth) between those involved in the content creation and their fellow community members. A sense of ownership results from the fact that time and energy have been invested by the community in the content creation process. Identification is enhanced by the fact that content better reflects the context, needs, and wants of the target community. An increased sense of awareness, ownership, and identification with the content decreases resistance to health messages (also called counterarguing) as the messages are perceived as coming from sources that have been internally validated rather than being foreign and external to the community. Localization through the incorporation of local narratives and simple visuals yields content that can be adapted for other audiences in a cost- and time-efficient manner. Incorporating local stories and the voices of community members results in content that aligns desired health messages with local beliefs, perspectives, and language used to communicate around these issues. As such, content relies more on audio than visual components for its cultural resonance and can be easily adapted for other audiences—often simply by changing the narrative voiceover. Easier adaptation, in turn, facilitates scaling of health education to other regions. Furthermore, simplifying visual components reduces the financial burden associated with transferring large data files. Art assets Digital illustration tools such as Photoshop or Adobe Illustrator are useful; if animations will be incorporated, specify the naming conventions for layers and individual elements to be animated, for example: “character_bodypart” (eg, girl_head, girl_body, girl_armL, girl_armR, girl_legL) Digital illustration tools such as Photoshop or Adobe Illustrator can be used to create simple images that underscore teaching messages and enhance engagement. Animation (art assets edited to create the illusion of movement) If animation used, After Effects and/or Premiere Pro can be useful software assets; use animatic as a guide layer. An “animatic” (Multimedia Appendix 13) can be used as a guide layer for animation. Archiving Name final videos according to consistently defined conventions (ie, FINAL_ Grow Great_1_July18); file video creation documents and all iterations for future look-back; file art, music, and sound assets in a production library for reuse in future projects. Human beings are hardwired to learn through stories and personal narratives. By collaborating with target communities to (1) identify and shape relevant narratives, (2) harness local talent and expertise to convey priority health messages through them, and (3) “digitally package” the resulting content for easy, open-access global scaling, we can marry the oldest and newest forms of teaching in a synergistic and innovative approach to health education. 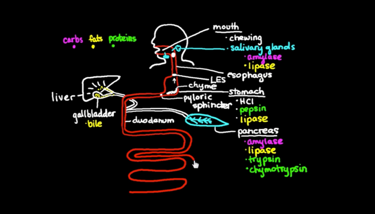 Basic digestion: sample physiology teaching video created in 2013. 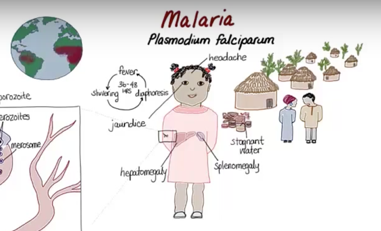 Malaria teaching video created in 2014 for Stanford Medicine's infectious disease course. 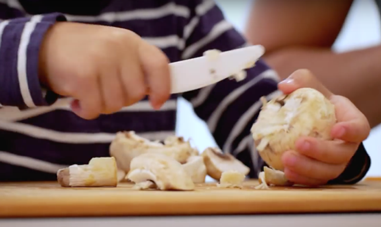 Stanford's child nutrition and cooking trailer was created in 2014. 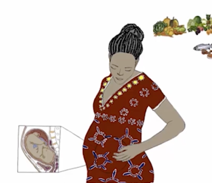 Xhosa nutrition in pregnancy video created for South African maternal child health promotion in 2015. 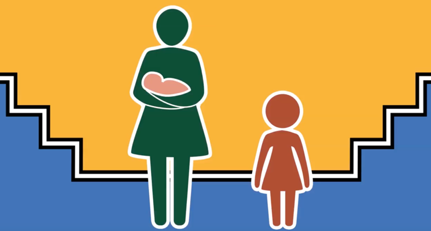 Hindi nutrition in pregnancy video adapted for Indian maternal child health promotion in 2017. 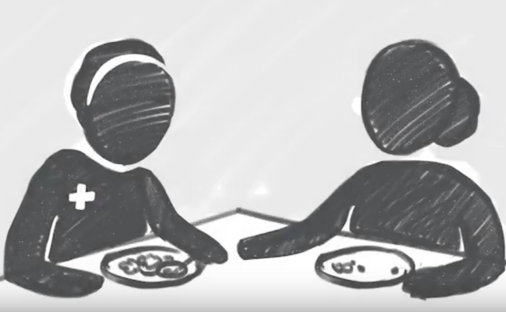 Stanford's Introduction to Food and Health trailer, created in 2016. Trailer for health across the gender spectrum (massive open online course) 2017. 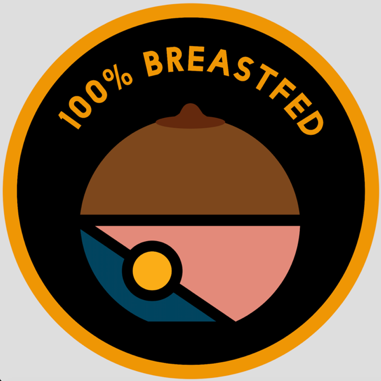 100% Breastfed trailer, launched in South Africa in 2018. Road to health trailer created for the South African Department of Health in 2018. 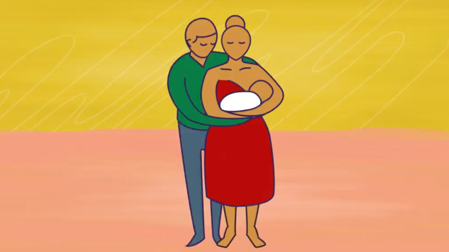 Breastfeeding video created for the South African National Department of Health in 2018. 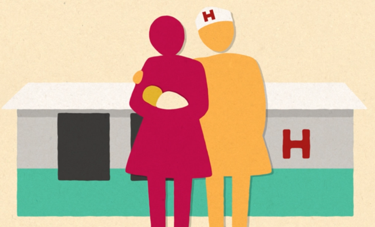 Kangaroo mother care video created for the South African National Department of Health in 2018. 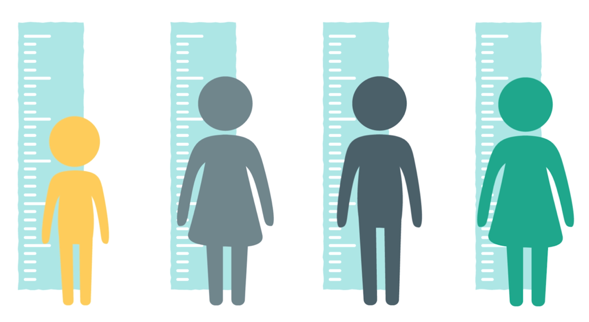 Teaching video (derived from a recorded interview) created for open online course: Health Across the Gender Spectrum. 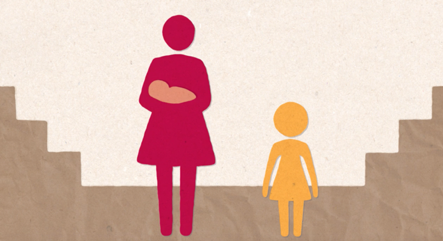 Growth stunting awareness video created with the DG Murray Trust, South Africa, 2018. Glanz K, Rimer BK, Viswanath K. Health behavior and health education: theory, research, and practice. Hoboken, NJ: John Wiley & Sons; 2008. World Health Organization. World health statistics 2016: monitoring health for the SDGs sustainable development goals. In: World health statistics 2016. Geneva: World Health Organization; 2016. Schank RC, Berman TR. The pervasive role of stories in knowledge and action. In: Narrative impact: Social and cognitive foundations. Oxfordshire: Psychology Press; 2003:287-288. Slater MD. Entertainment education and the persuasive impact of narratives. In: Green MC, Strange JJ, Brock TC, editors. Narrative impact: Social and cognitive foundations. Mahwah, NJ: Lawrence Erlbaum Associates Publishers; 2002:157-181. Hanington B, Martin B. Universal methods of design: 100 ways to research complex problems, develop innovative ideas, and design effective solutions. Beverly, MA: Rockport Publishers; 2012. Burns C, Dishman E, Verplank W, Lassiter B. Actors, hairdos & videotape: Informance design. 1994 Presented at: CHI '94 Conference Companion on Human Factors in Computing Systems; April 24 - 28, 1994; Boston, Massachusetts, USA. Kratzke C, Cox C. Smartphone technology and apps: rapidly changing health promotion. Glob J Health Educ Promot 2012;15(1):15-16. Guo PJ, Kim J, Rubin R. How video production affects student engagement: an empirical study of MOOC videos. 2014 Presented at: L@S '14 Proceedings of the first ACM conference on Learning; March 04 - 05, 2014; Atlanta, Georgia, USA p. 41-50. ©Maya Adam, Shannon A McMahon, Charles Prober, Till Bärnighausen. Originally published in the Journal of Medical Internet Research (http://www.jmir.org), 30.01.2019.